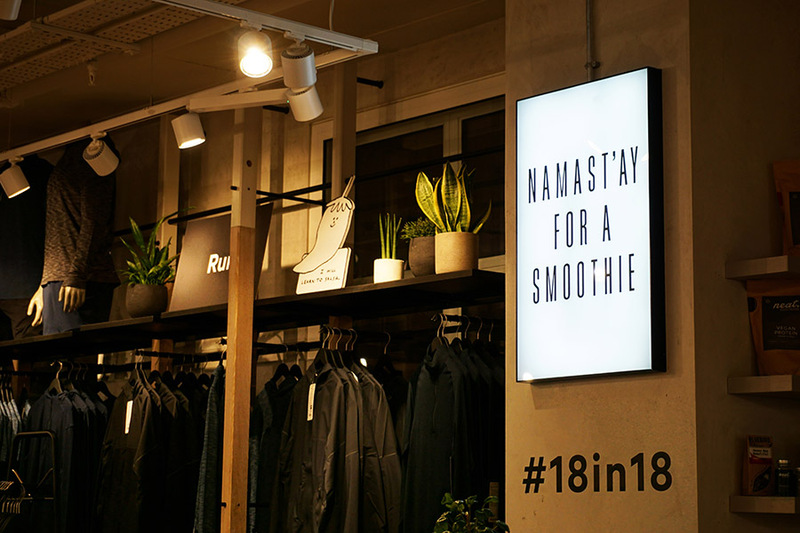 Graduate student Holly St Clair was commissioned by sportswear brand Lululemon to illustrate their #18in18 campaign. 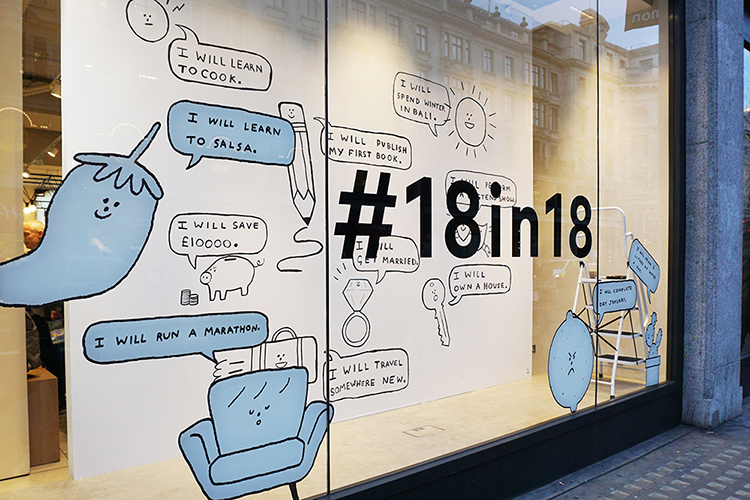 She spent every Saturday of January 2018 drawing in the window space of their Regent Street flagship store creating custom illustrations for shoppers in the afternoons. Holly graduated from Camberwell last summer and has been busy taken part in Flags, a show with Beach London, being interviewed by glasses brand Bailey Nelson and now she is here taking to us about her most recent project with Lululemon. It started when Lululemon sent a brief to the agency I work part-time for and it just so happened to have my work included in it! Beach London, who did the art direction, introduced us and we went from there. I was asked to illustrate Lululemon’s annual alternative to New Years Resolutions, where people are asked to focus on year long goals – essentially you ask yourself, what eighteen things do I want to do in 2018? 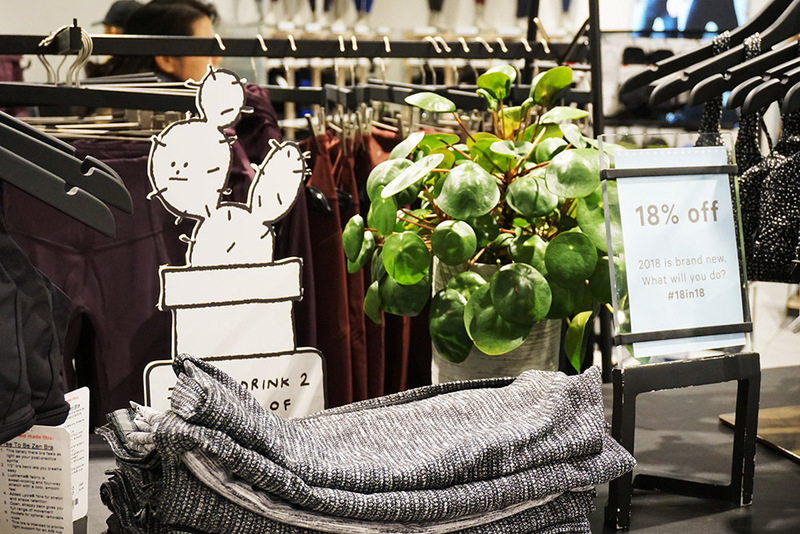 It’s quite a different artistic direction for Lululemon to go in. In the past the focus has been very much on a kind of photographic idealism – amazing people doing nuts things with their bodies – to go down the illustrated, somewhat self-deprecating, route was really brave. How did you feel and who was involved? It was interesting! 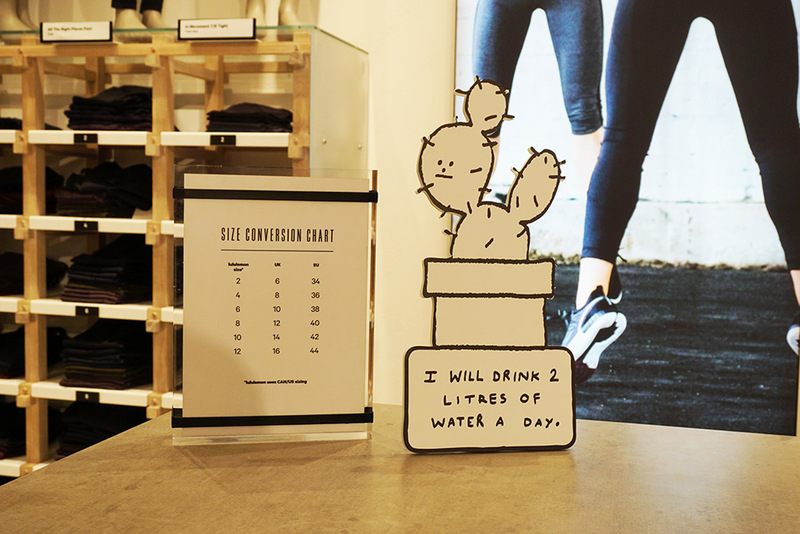 To be honest, I’ve never owned sportswear in my life so I felt a little bit like a fish out of water – but the people at Lululemon were so kind and I really loved the idea behind the campaign. They were keen to make a campaign that stayed away from tired and nasty New Year fitness goals – stuff like “I will lose weight” or “I will get a six pack” – and think about wellness as a whole. It was really different to how I imaginedThe client was Lululemon and the art direction came from creative agency Beach London. All the window displays and shop decor was made by Lucky Fox. Did you enjoyed drawing live at the window? The first weekend I did it I was so nervous! It took a while before I learnt to ignore the tourists taking photos and curious bystanders. As I had my back to the street it became quite easy to just stick my headphones in and get on with things. It was definitely a challenge drawing on such a large canvas, without sketching, and in such a small space, but I was really happy with the outcomes. I make work that’s silly and tongue in cheek, there’s surprisingly a lot of thought and theory behind it. I’m super interested in aesthetics and visual culture and what it all ‘means’. I’m working on expanding the skills I have, getting better at animation and learning a little bit of simple web coding. Why did you choose to study at Camberwell? I realised all the illustrators I loved and admired were at Camberwell! I’m London born and raised so I knew of UAL’s reputation as “the” art uni, I signed up for the Art Foundation course at CCW and everything just kind of flowed on from there. How has it been your time after graduating, do you thinks is easy to get a job? I work with my close friend Lily Kong on Hi Bye Studio, a collaborative practice. We’ve been coming up with a lot of ideas for briefs and publications, watch this space! We’re both dog obsessed and seeing as it’s the Year of the Dog according to the Chinese zodiac, we’ve got some dog themed projects lined up. Do you have any influence? I’m slightly obsessed with ‘heta-uma’ and have been for a few years now. It’s a Japanese art style and roughly translates as “bad but good”, the work is so out there and such a gnarly rejection of all the stereotypes of East Asian aesthetics (graphic minimalism, delicateness). I love anything that makes me question my concepts of “good”. Finally, what recommendation would you give to graduating students? If you’re an illustrator interested in freelancing I’d really recommend starting a Tictail or Etsy whilst you’re studying. Sell prints, t-shirts, pins – whatever you can think of! They don’t have to be amazing. It’ll help you get the hang of loads of really useful skills: product photography, expenses, shipping, time management, copy-writing. Starting is the hardest bit. It takes a long, long time to start getting regular sales, I’m only just getting there myself and I’ve had an online store for years!